In the 1890's, breeders of Manx were few, and those that were, were usually dedicated to the breed. 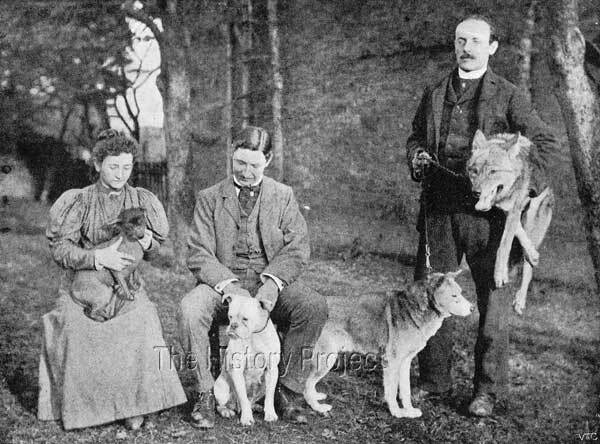 Numbered amongst the breeders/owners of Manx in the early 1890's were Mr. & Mrs. Sam Woodiwiss, Mr. E. Sydney Woodiwiss, Mr. Jungbluth, Mr. & Mrs. H.C.Brooke, and Mrs. L. Herring, followed a little later, by Lady Alexander, Miss Samuels, Mrs. Moseley, Mr. Gambier Bolton, Miss Cochran and Miss Jay. Mr. and Mrs. H.C. Brooke, had already developed a wide reputation as connoisseurs of curious pets, with a taste in dogs, wolves, cats, and even rare breeds of rat. They were especially fond of the foreign dog varieties, and Mr. Brooke, together with Mr. G.R. Krehl, were responsible for introducing the ancient breed of the 'Dogue du Bordeaux' into Great Britain. Their cache of foreign dog varieties included the Mexican Hairless, the Esquimax, the Dogue du Bordeaux, the French Toy Bulldog, an Australian Wild Dingo, a Russian grey Wolf, and even a white Siberian Wolf. 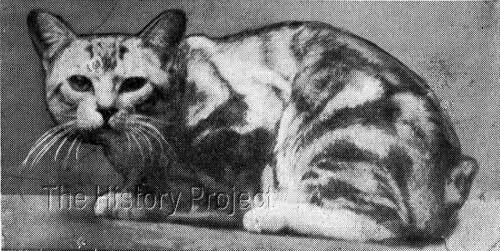 The Brooke's had already purchased, bred, reared and successfully shown a number of Manx cats, before acquiring 'Bonhaki' from fellow Manx breeder, Mr. Jungbluth. Their initial stud male, was 'Kater' (NCC:3252), born in June 1894, who had also been bred by Mr. Jungbluth, and from 'Kater' they had bred their own very show-worthy brown classic tabby Manx male, 'Katzenjammer' (NCC:3253), born in April, 1896. 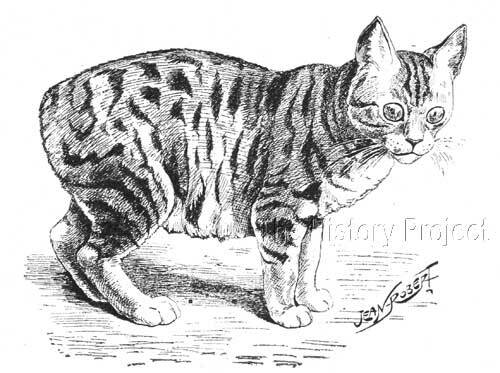 But with his appearance in late 1897 and from his debut show as a kitten in early 1898, the silver classic tabby 'Bonhaki' was quickly assessed by those in the know, as being a standard-bearer for his breed. When he died at the tender age of only twenty-seven months in February 1900, he had already claimed five championships and a reputation that was unlikely to be matched within his own variety. As a kitten at that milestone Botanic Show of 1898, he instantly attracted the attention of the Princess of Wales, (later Queen Alexandra). 'Bonhaki' must have made quite an impression, as it is indeed noteworthy, that later, around 1903, her husband, then as His Majesty King Edward VII, set about purchasing two breeding pair of Manx cats. From left to right: Mrs. H.C. Brooke with her Mexican Hairless dog 'Oh Susannah! ', Mr. C.G. Hopton, Hon. Sec. of the American Bulldog Club, with 'Chelsworth Sly', and Mr. H.C. Brooke, with his Australian Dingo 'Myall' and a young Russian Wolf. Although we are clearly informed that the breeder of 'Bonhaki' was Mr. Jungbluth, we have absolutely no information with regard to his parentage, which is listed as 'unknown'. The fact that we know he was bred by a fancier, indicates that neither of his parents were registered, but that they were part of a planned breeding program. This was not uncommon in the case of Manx, many of whom, like 'Bonhaki', were themselves registered, but without any known pedigree. In many cases, where details are recorded, the description of parents is limited to only their colour. For example, "by Black Manx, out of Black Manx". In some cases, even of the cats which were themselves registered, they were duly listed with their gender and as owned by such and such a person, but without even having their own colour or patterns recorded! 'Bonhaki' appears in the register of The National Cat Club, under registration number 3258, on page 20 of Volume 5, covering the period 1896 to 1899. His birth date is recorded as 'November, 1897 and his owner is listed as Mrs. H.C. Brooke. 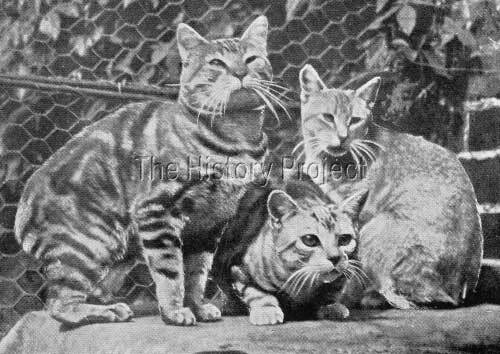 Two Manx cats and an Abyssinian, all owned by Mr. & Mrs. H.C. Brooke 'Katzenjammer'(left), 'Ch. Bonhaki'(center), and 'Sedgemere Peaty'(right). (Editor's note:) 'King Clinkie' was destined some time later to reside at Bishopsgate, where he supplemented Lady Marcus Beresford's breeding program for Manx cats. As the parentage of 'Bonhaki' is unknown, there is no method whereby we may verify whether he had either full, or sire, or dam siblings. (*Editors note: 'Bonhaki' was the only silver tabby shown up until that time. Others would follow, such as Miss Florence Dresser's 'Bonhaki Jnr' and Mr. Gambier Bolton's 'Manx Silverwing'). From his debut show as a kitten in early 1898, 'Bonhaki' was quickly assessed as being a standard-bearer for his breed. 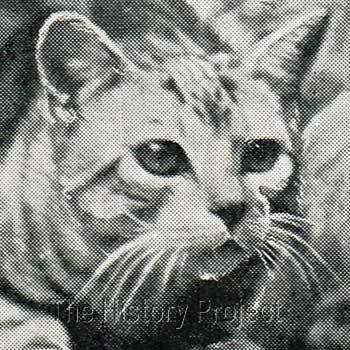 'BONHAKI JUNIOR' (aka 'Bonhaki II), Silver Tabby Manx male, born 24th July, 1899. Sired by 'Bonhaki' out of Miss Dresser's 'Belle Malone'. Bred and owned by Miss Florence Dresser. His wins are recorded as: 3rd, Crystal Palace 1900; 1st Botanic, 1901; 2nd, Crystal Palace 1901, 2nd Victoria Hall, 1902; and 3rd, Botanic, 1902. 'CHELSWORTH DEEMSTER', Black male Manx, born 3rd August, 1899. Sired by 'Bonhaki', but with the dam not listed. Breeder/Owner: Mr. & Mrs. H.C. Brooke. 'DACHSHASE', Black female Manx, born December, 1899. (Our Cats: 1900) Her name also appears as	'Dachhase' in the CCR, and as 'Dach Hase' in NCC.v6. Sired by 'Bonhaki' the dam is simply listed as a daughter of 'Katzenjammer'. The breeder is Miss Elliott, and owners are Mr. & Mrs. H.C. Brooke. 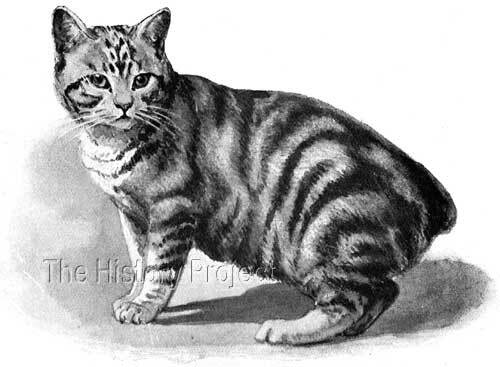 So on the surface of it, it would appear that the Brooke's sold a Manx daughter of their homebred male 'Katzenjammer' to Miss Elliott, then allowed her to be bred to 'Bonhaki' with a kitten from the breeding returning to Mr. & Mrs. Brooke. At the time of writing it is unclear as to whether any further progeny were produced from either 'Bonhaki' himself or his listed sons and daughter. But to date, none have been traced. It is a sad, but true, fact that some earthly treasures are at best only loaned to us for a very short time. If we are fortunate enough to recognise them while we have them, we learn to love them and appreciate their beauty, and all the while they teach us about the seemingly limitless possibilities that are open to us. It is only when, like wisps they are gone, that we truly begin to realise the immensity of their value, and how fortunate was our experience in having them in our lives. It should teach us not to take any gift for granted and to continually reassess our opportunities. 'Bonhaki' was like a number of valuable cats, he shone like a star from the beginning, and like a meteor, he blazed a short but bright trail and was gone. In the time he was with Mr. and Mrs. Brooke, he set a new high standard for the Manx, and demonstrated that a Manx cat could hold its own in the show ring, against any other breed. Your Cat Trinity Press, by A. Bary-Saunders.